Fox Searchlight and director Wes Anderson have a hit on their hands with Isle of Dogs. It is a great movie. The specialty film is a stop-motion animated feature that made an estimated $1.57 million from 27 theaters in six North American cities. That is the biggest opening of any in his career. Opening on National Puppy Day March 23 was a great idea, although I don't know how many people knew it was puppy day. (I'm a huge puppy/dog supporter and I had no idea. So I think people just care about dogs and thus the movie did well too) Isle of Dogs will now expand to 22 additional markets for a total of 150 to 175 theaters. It opens overseas in May. It had its world premiere in February at the Berlin International Film Festival, where Anderson won the Silver Bear for best director. The theater average upon opening in North America was $58,148 and that is the best ever for a title opening in 25 or more theaters. The Blair Witch Project was the last record holder back in 1999. It also secured the top average of the year to date, despite playing in far more theaters than most specialty releases. Fox Searchlight opted it in 27 theaters instead of the normal four in L.A. and N. Y so more people could see is faster than usual.In addition to L.A. and N.Y. Isle of Dogs also opened in Washington, San Francisco, Toronto and Austin, Texas. Well, it worked. "We thought the average would be $45,000 to $50,000. To get to nearly $60,000 proves that we were right in giving fans an opportunity to come out as soon as possible," says Fox Searchlight distribution chief Frank Rodriguez, saying that it did well in mainstream multiplexes as it did in arthouses. The story is set in future Japan when a boy tries to rescue his pet after the government blames dogs for a flu outbreak and exiles them to a place called Trash Island. The voice cast is great. All seem perfect for their roles. They include; Bryan Cranston, Edward Norton, Frances McDormand, Yoko Ono, Greta Gerwig, Tilda Swinton, Jeff Goldblum, Harvey Keitel, Bob Balaban, Bill Murray, Scarlett Johansson, Liev Schreiber, Courtney B. Vance and Koyu Rankin. The movie goes at a fast pace it's a whirlwind of creativity. It is so inventive and there is so much to take in, you can't take your eyes off the screen. The animators are beyond noteworthy and handle the stop-motion puppets so well that you are convinced the dogs are in front of you. Their work is so masterfully done that this shows they are a true credit to their professions. Love the master/pet connection that comes across. This film really needs you to see it a second time. Man's best friend in puppet form has never looked better. Squint your eyes and you'd swear your dog is on screen. 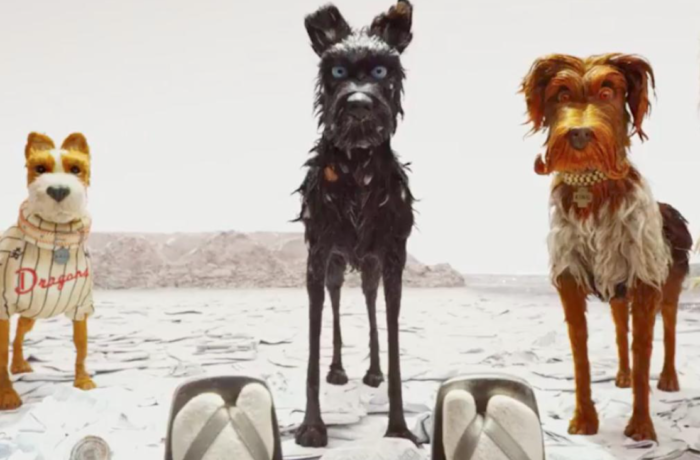 The rating is PG-13 but take the children, it is worth it, and in today's chaos of life - we so need more movies like Isle of Dogs.